DML Central– online presence for the Digital Media and Learning Research Hub located at the systemwide University of California Humanities Research Institute and hosted at the UC Irvine campus. Includes blog posts, Multiliteracies research, and educator resources. Considering Music as a Multiliterate Tool-Portfolio project that aims to help high-school aged students link the music that they listen to leisurely with that which they study in the classroom. Multiliteracy-Self-education community to publish thoughts and ideas. Picture Writing and Image Making– Webpage of two dynamic art-and-literature based approaches to writing with lessons and student work. International Society for Technology in Education-Outlines the standards established for students, teachers, and administrators for technology use and knowledge. A Multiliteracies Project: Exploring New Learning in the Classroom-Digital collaboration project exploring education policy issues pertaining to multiliteracies. Anstey, Michèle, and Geoff Bull. Teaching and Learning Multiliteracies: Changing Times, Changing Literacies. Newark: International Reading Association, 2006. Print. Cope, Bill, and Mary Kalantzis, eds. Multiliteracies: Literacy Learning and the Design of Social Futures. Abingdon: Routledge, 2000. Print. Danaher, Patrick Alan, Beverley Moriarty, and Geoff Danaher. Mobile Learning Communities: Creating New Educational Futures. New York: Routledge, 2009. Print. Hanauer, David I. Scientific Discourse: Multiliteracy in the Classroom. New York: Continuum, 2006. Print. Healy, Annah. 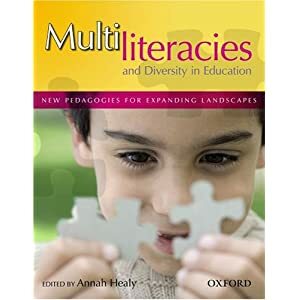 Multiliteracies and Diversity in Education: New Pedagogies for Expanding Landscapes. South Melbourne: Oxford UP, 2008. Print. Kalantzis, Mary, and Bill Cope. Transformations in Language and Learning: Perspectives on Multiliteracies. Australia: Common Ground Publ., 2001. Print. Makin, Laurie, and Criss Jones-Diaz. Literacies in Early Childhood: Changing Views, Challenging Practice. Sydney: MacLennan & Petty, 2006. Print. Mills, Kathy A. Multiliteracies: a Critical Ethnography : Pedagogy, Power, Discourse and Access to Multiliteracies. Brisbane: Queensland University of Technology, 2006. Print. Mills, Kathy. The Multiliteracies Classroom. Bristol: Multilingual Matters, 2011. Print. Morocco, Catherine Cobb. Supported Literacy for Adolescents: Transforming Teaching and Content Learning for the Twenty-First Century. San Francisco: Jossey-Bass, 2008. Print. Pullen, Darren L., and David R. Cole. Multiliteracies and Technology Enhanced Education: Social Practice and the Global Classroom. Hershey: Information Science Reference, 2010. Print. Selber, Stuart A. Multiliteracies for a Digital Age. Carbondale: Southern Illinois UP, 2004. Print. Sheridan, David M., and James A. Inman. Multiliteracy Centers: Writing Center Work, New Media, and Multimodal Rhetoric. New York: Hampton, 2010. Print. Sollars, Valerie. Issues in Multi-Literacy. Graz: Council of Europe, 2002. Print. Unsworth, Len. Teaching Multiliteracies Across the Curriculum: Changing Contexts of Text and Image in Classroom Practice. Buckingham: Open University, 2001. Print.